You can increase your savings by taking advantage of the dynamic scaling feature set available in Amazon EMR. The ability to scale the number of nodes in your cluster up and down on the fly is among the major features that make Amazon EMR elastic. 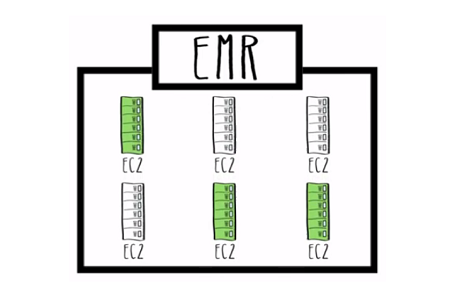 You can take advantage of scaling in EMR by resizing your cluster down when you have little or no workload. You can also scale your cluster up to add processing power when the job gets too slow. This allows you to spend just enough to cover the cost of your job and little more. Knowing the complex logic behind this feature can help you take advantage of it to save on cluster costs. In this post, I detail how EMR clusters resize, and I present some best practices for getting the maximum benefit and resulting cost savings for your own cluster through this feature. When an EMR scale cluster is scaled down, two different decommission processes are triggered on the nodes that will be terminated. The first process is the decommissioning of Hadoop YARN, which is the Hadoop resource manager. Hadoop tasks that are submitted to Amazon EMR generally run through YARN, so EMR must ensure that any running YARN tasks are complete before removing the node. If for some reason the YARN task is stuck, there is a configurable timeout to ensure that the decommissioning still finishes. When this timeout happens, the YARN task is terminated and is instead rescheduled to a different node so that the task can finish. The second decommission process is that of the Hadoop Distributed File System or HDFS. HDFS stores data in blocks that are spread through the EMR cluster on any nodes that are running HDFS. When an HDFS node is decommissioning, it must replicate those data blocks to other HDFS nodes so that they are not lost when the node is terminated. So how can you use this knowledge in Amazon EMR? The following are some issues to consider when resizing your clusters. EMR clusters can use two types of nodes for Hadoop tasks: core nodes and task nodes. Core nodes host persistent data by running the HDFS DataNode process and run Hadoop tasks through YARN’s resource manager. Task nodes only run Hadoop tasks through YARN and DO NOT store data in HDFS. When scaling down task nodes on a running cluster, expect a short delay for any running Hadoop task on the cluster to decommission. This allows you to get the best usage of your task node by not losing task progress through interruption. However, if your job allows for this interruption, you can adjust the one hour default timeout on the resize by adjusting the yarn.resourcemanager.nodemanager-graceful-decommission-timeout-secs property (in EMR 5.14) in yarn-site.xml. When this process times out, your task node is shut down regardless of any running tasks. This process is usually relatively quick, which makes it fast to scale down task nodes. When you’re scaling down core nodes, Amazon EMR must also wait for HDFS to decommission to protect your data. HDFS can take a relatively long time to decommission. This is because HDFS block replication is throttled by design through configurations located in hdfs-site.xml. This in turn means that HDFS decommissioning is throttled. This protects your cluster from a spiked workload if a node goes down, but it slows down decommissioning. When scaling down a large number of core nodes, consider adjusting these configurations beforehand so that you can scale down more quickly. For example, consider this exercise with HDFS and resizing speed. Modifying these configurations can speed up the decommissioning time significantly. Try the following exercise to see this difference for yourself. Connect to the master node of your cluster using SSH (Secure Shell). For more information, see Connect to the Master Node Using SSH in the Amazon EMR documentation. Then paste in the following configuration setup in the hdfs-site properties. Disclaimer: These values are relatively high for example purposes and should not necessarily be used in production. Be sure to test config values for production clusters under load before modifying them. Resize your EMR cluster from six to five core nodes, and look in the EMR events tab to see how long the resize took. Repeat the previous steps without modifying the configurations, and check the difference in resize time. While performing this exercise, I saw resizing time lower from 45+ minutes (without config changes) down to about 6 minutes (with modified hdfs-site configs). This exercise demonstrates how much HDFS is throttled under default configurations. Although removing these throttles is dangerous and performance using them should be tested first, they can significantly speed up decommissioning time and therefore resizing. Shrink resizing timeouts. You can configure EMR nodes in two ways: instance groups or instance fleets. For more information, see Create a Cluster with Instance Fleets or Uniform Instance Groups. EMR has implemented shrink resize timeouts when nodes are configured in instance fleets. This timeout prevents an instance fleet from attempting to resize forever if something goes wrong during the resize. It currently defaults to one day, so keep it in mind when you are resizing an instance fleet down. If an instance fleet shrink request takes longer than one day, it finishes and pauses at however many instances are currently running. On the other hand, instance groups have no default shrink resize timeout. However, both types have the one-hour YARN timeout described earlier in the yarn.resourcemanager.nodemanager-graceful-decommission-timeout-secs property (in EMR 5.14) in yarn-site.xml. Watch out for high frequency HDFS writes when resizing core nodes. If HDFS is receiving a lot of writes, it will modify a large number of blocks that require replication. This replication can interfere with the block replication from any decommissioning core nodes and significantly slow down the resizing process. Although manual scaling is useful, a majority of the time cluster resizes are executed dynamically through Amazon EMR automatic scaling. Generally, the details of the automatic scaling policy must be tailored to the specific Hadoop job, so I won’t go into detail there. Instead, I provide some general guidelines for setting up your cluster’s auto scaling policies. The following are some considerations when setting up your auto scaling policy. Choose the right metrics for your node types to trigger scaling. For example, scaling core nodes solely on the YARNMemoryAvailablePercentage metric doesn’t make sense. This is because you would be increasing/decreasing HDFS total size when really you only need more processing power. Scaling task nodes on HDFSUtilization also doesn’t make sense because you would want more HDFS storage space that does not come with task nodes. A common automatic scaling metric for core nodes is HDFSUtilization. Common auto scaling metrics for task nodes include ContainerPendingRatio and YarnMemoryAvailablePercentage. Note: Keep in mind that Amazon EMR currently requires HDFS, so you must have at least one core node in your cluster. Core nodes can also provide CPU and memory resources. But if you don’t need to scale HDFS, and you just need more CPU or memory resources for your job, we recommend that you use task nodes for that purpose. As described earlier, one of the two EMR node types in your cluster is the core node. Core nodes run HDFS, so they have a longer decommissioning delay. This means that they are slow to scale and should not be aggressively scaled. Only adding and removing a few core nodes at a time will help you avoid scaling issues. Unless you need the HDFS storage, scaling task nodes is usually a better option. If you find that you have to scale large numbers of core nodes, consider changing hdfs-site.xml configurations to allow faster decommission time and faster scale down. Task nodes don’t run HDFS, which makes them perfect for aggressively scaling with a dynamic job. When your Hadoop task has spikes of work between periods of downtime, this is the node type that you want to use. You can set up task nodes with a very aggressive auto scaling policy, and they can be scaled up or down easily. If you don’t need HDFS space, you can use task nodes in your cluster. Automatic scaling is a perfect time to use EMR Spot Instance types. The tendency of Spot Instances to disappear and reappear makes them perfect for task nodes. Because these task nodes are already used to scale in and out aggressively, Spot Instances can have very little disadvantage here. However, for time-sensitive Hadoop tasks, On-Demand Instances might be prioritized for the guaranteed availability. Don’t fall into the trap of making your scale-in policy the exact opposite of your scale-out policy, especially for core nodes. Many times, scaling in results in additional delays for decommissioning. Take this into account and allow your scale-in policy to be more forgiving than your scale-out policy. This means longer cooldowns and higher metric requirements to trigger resizes. You can think of scale-out policies as easily triggered with a low cooldown and small node increments. Scale-in policies should be hard to trigger, with larger cooldowns and node increments. One last thing to consider when scaling core nodes is the yarn.app.mapreduce.am.labels property located in yarn-site.xml. In Amazon EMR, yarn.app.mapreduce.am.labels is set to “CORE” by default, which means that the application master always runs on core nodes and not task nodes. This is to help prevent application failure in a scenario where Spot Instances are used for the task nodes. This means that when setting a minimum number of core nodes, you should choose a number that is greater than or at least equal to the number of simultaneous application masters that you plan to have running on your cluster. If you want the application master to also run on task nodes, you should modify this property to include “TASK.” However, as a best practice, don’t set the yarn.app.mapreduce.am.labels property to TASK if Spot Instances are used for task nodes. Before wrapping up this post, I have one last piece of information to share about cluster resizing. When resizing core nodes, you might notice that HDFS decommissioning takes a very long time. Often this is the result of storing many small files in your cluster’s HDFS. Having many small files within HDFS (files smaller than the HDFS block size of 128 MB) adds lots of metadata overhead and can cause slowdowns in both decommissioning and Hadoop tasks. Keeping your small files to a minimum by aggregating your data can help your cluster and jobs run more smoothly. For information about how to aggregate files, see the post Seven Tips for Using S3DistCp on Amazon EMR to Move Data Efficiently Between HDFS and Amazon S3. In this post, you read about how Amazon EMR resizing logic works to protect your data and Hadoop tasks. I also provided some additional considerations for EMR resizing and automatic scaling. Keeping these practices in mind can help you maximize cluster savings by allowing you to use only the required cluster resources. If you found this post useful, be sure to check out Seven Tips for Using S3DistCp on Amazon EMR to Move Data Efficiently Between HDFS and Amazon S3 and Dynamically Scale Applications on Amazon EMR with Auto Scaling. Brandon Scheller is a software development engineer for Amazon EMR. His passion lies in developing and advancing the applications of the Hadoop ecosystem and working with the open source community. He enjoys mountaineering in the Cascades with his free time.